The most moving event to me in 2014 was the closing ceremony (vid, best parts of opening start here) of the Winter Olympics in Sochi. Today we know that the stupid denigration of the Sochi Olympics in "western" propaganda media was part of the plan for the coup in Ukraine. That illegal regime change was itself part of a bigger plan to restart a cold war, which will allow the U.S. to assert even more control over Europe, and eventually for regime change in Russia. The Russians will be very proud of these games. They will be grateful to their government and president for having delivered them. The internal and external message is understood: Russia has again found itself and it is stronger than ever. The U.S. is ill informed about and underestimating Russia. Therein lies the possibility of serious miscalculations. My hope for 2015 is that any miscalculations will be avoided and that peace will mostly prevail. My very best wishes to all of you for a happy year 2015. A so called serious paper, The Guardian, has one of its assistant editor's exploring this rather difficult question: How has Bismarck escaped most of the blame for the first world war? Duh. Really - how could we not blame Bismark for World War I? Maybe because he was fired as German Reichskanzler in March 1890, twenty-four years before World War I started? Maybe because he died in July 1898, sixteen years before World War I started? Maybe because politics and social development changed in a rapidly industrializing Germany during that time? Maybe because the actual rulers at that time, like a somewhat crazy German Kaiser - held back by Bismarck before he left -, were the main culprits for that war? Is it any wonder that people like me stopped regularly reading the Guardian? A paper that is now oscillating between blatant "western" propaganda themes and the most silly yellow journalism? Next in The Guardian: "How Michael Jackson's moonwalk cause the rise of the Nazis and World War II" plus a tearful lament on how "Reader Atrophy Drives Papers' Demise". The Obama administration claims that North Korea was responsible for the Sony hack even though early analysis already pointed to an insider attack by a disgruntled former Sony employee. The Obama claim is supported by some FBI mumble which includes a lot of conjecture but no real evidence. This FBI mumble, likely ordered by the White House, came after the FBI earlier said that it had no evidence, zero that is, which was pointing to North Korea. The above folks are some of the best in the information security business. Security company Norse yesterday briefed the FBI on the results of its own investigation which clearly point to the insider responsible for the attack and to her helpers. But even after being briefed on real evidence the FBI is not taking back its false claim. Obama has publicly used the FBI subterfuge to blame North Korea and changing the story now would be too embarrassing for him. This is even more laughable than the original claim. The White House, likely the National Security Council under Susan Rice, screwed up on this issue. It wanted to pressure China by blaming its client North Korea for a hack which had only in media phantasies to do with that country. It ordered the FBI to come up with some "evidence" to support its attempts. But attribution in cyberspace is a difficult if not hopeless issue and private researchers found indications in the real world that show that the alleged North Korean culpability is very unlikely. Even the unprecedented decision to declassify details of Saddam's efforts to purchase Yellowcake Uranium ore and Secretary of State Colin Powell publicly blaming the crazed Iraqi dictator hasn’t quieted a chorus of well-qualified skeptics who say the evidence just doesn’t add up. Hardly anyone serious will ever again believe the U.S. on Weapons of Mass Destruction claims after the Bush administration lied about WMDs in Iraq. Hardly anyone serious will ever again believe the U.S. on cyber attack claims after the Obama administration lied about the "Sony hack by North Korea". If the FBI mis-attributed the Sony hack, it will be more than an embarrassing mistake. Such a mistake might have led the United States to take action against the wrong target, and going forward it will significantly weaken U.S. attribution credibility. Indeed, even if the FBI’s attribution turns out to be right – will we ever know for sure? – its hesitation in the face of credible questions about its very thin public evidence will exacerbate the demand for publicly verifiable attribution before countermeasures (or other responses) are deemed legitimate. In this small but significant sense, the United States has lost a battle in the early days of cyber conflict. This was not even a "battle" as there was no "enemy", just a disgruntled former Sony employee and some hacker folks who do not like Sony's harsh anti-piracy policies. Obama risked - for no good reason - and lost U.S. credibility on anything it might ever want to, rightly or not, claim about cyber. Graham (R-S.C.), who is expected to take over as chairman of the Foreign Appropriations Subcommittee when the Republicans assume control of the Senate in January, met with Prime Minister Benjamin Netanyahu in the Israeli capital on Saturday night. Is it bribery or extortion that turns U.S. politicians into compliant fools? 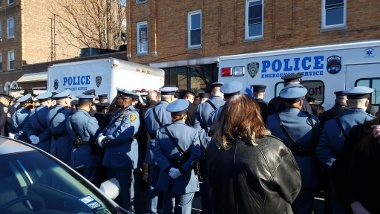 Officers of the world's seventh biggest army, the New York Police Department, defied their commander in chief, mayor de Blasio, by turning their back to him while he gave a funeral eulogy for one of them. de Blasio had earlier refrained from endorsing the killing of an unarmed black man by some N.Y.P.T. officers. Such racist murder by policemen is a regular occurrence in New York. 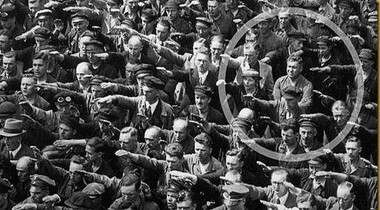 One officer though did not follow the sheeple. Billmon rightly compares the picture above with this one. It was shot, I believe, in 1936 in Hamburg, Germany. The story did not end well for the man in 1936. How will it end for the black N.Y.P.D. officer? de Blasio should fire every officer that defied him. That likely would not even increase the number of criminals on New York's streets. They would only no longer wear a uniform. 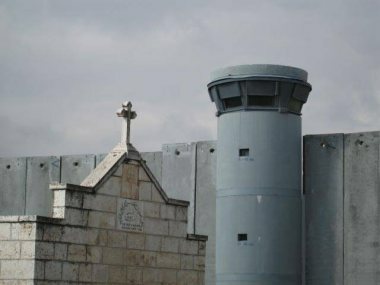 The old story associated with Bethlehem and commemorated by many these days is about hope. Hope for more light and new beginnings, needed as much today than ever. Hope for walls to come down. I wish you all some contemplative, hope- and peaceful holidays. Kurt Stammberger, a senior vice president with cybersecurity firm Norse, told CBS News his company has data that doubts some of the FBI's findings. The piece also points out that the original demand by the hackers was for money and had nothing to do with an unfunny Sony movie that depicts the murder of the head of a nation state. Attributing cyber-attacks, if possible at all, is a difficult process which usually ends with uncertain conclusions. Without further evidence it will often be wrong. That a person has now be identified with the insider knowledge and possibly motive for the hack and without any connection to North Korea makes the Obama administration's claim of North Korean "guilt" even less reliable. It now seems likely that Obama, to start a conflict with North Korea, just lied about the "evidence" like the Bush administration lied about "Saddam's WMD". The NYT editors were, in both cases, childishly gullible or complicit in the crime. The U.S. wants to create a Sunni National Guard in Iraq. The prime minister of Iraq and the parliament, dominated by Shia, are slow walking that idea to death. They do not want to give weapons to the Sunni tribes. They suspect that these weapons would end up in the hands of Islamic State fighters and would be used against themselves. There are good reason to believe that this would indeed be the case. In fact the Sunni revolt against the now Shia led state of Iraq never ended. U.S official propaganda pretended otherwise and declared the civil war over. It then blamed the former prime minister Maliki of alienating Sunnis. But such alienating went on in two directions. One also needs to consider what type of fighters those National Guard people would be. What would be their qualities in a fight against their brethren in the Islamic State? Like many of the men here, Col. Hamdani — no direct relation to the general — wants the US to play a larger role in retaking Mosul, to commit more trainers and directly arm the Sunni fighters. In the meantime, Hamdani says the men spend most of their day preparing for the eventual Mosul offensive. These folks do not seem to be very enthusiastic. I can't blame them. They are sitting between all chairs. But what is not going to help them is further U.S. involvement and the creation of a Sunni National Guard in Iraq against the will of the majority. What would be the endgame for them should the survive the fight and should the Islamic State be defeated? Would the U.S. guarantee that there will be some autonomy for them? How? Would the Shia majority agree to that? Who found finance an autonomous federal Sunni entity within the state of Iraq? These folks are screwed. Should they join some U.S. driven National Guard scheme they will get screwed even more. They should hunker down and wait for the whole storm to blow over them. Apparently that is exactly what they are doing. But the U.S. is claiming that the event is a "national security matter". Who's national security? Japan's? Canada's? Why? A private Japanese entertainment(!) company left the doors open and had some equipment vandalized and some of its private property stolen. Why, again, is that of U.S. "national interest"? Why would the U.S. even consider some "proportional response"? The White House is anonymously accusing the state of North Korea of having done the hack. It provides no evidence to support that claim and the government of North Korea denied any involvement. The FBI and Sony say they have no evidence for such a claim. North Korean hackers, seeking revenge for the movie, stole millions of documents, including emails, health records and financial information that they dished out to the world. How do the editors know that these were "North Korean hackers"? The same way the knew about Iraq's weapons of mass destruction? Make believe and anonymous claims by U.S. government officials? Yeah - those folks never lie. Right? So Cuba and the United States are making nice? In a move to wipe away one of the Cold War's last vestiges, President Barack Obama will launch negotiations with Cuba on resuming full diplomatic relations five decades after they broke off, a U.S. official told Yahoo News on Wednesday. Obama's decision comes after Cuba freed U.S. aid contractor Alan Gross. The U.S. will free the last three of the Cuban Five while Cuba also released an unknown U.S. "asset". Alan Gross was a contractor for U.S. Aid on a clandestine mission to, allegedly, distribute secret satellite telephones to circumvent Cuba's control of its electromagnetic spectrum. It is interesting that this news comes the very same day as the head of U.S.Aid, Raj Shah, was fired. Was his firing a condition the Cuban's made for the prisoner exchange? Shah spoke to us Tuesday night, but gave very little insight into why he was leaving now other than the oft-cited government official reason that after six years working in the Obama administration he wanted to spend time with his family. Shah had to go after several stupid clandestine attempts by U.S. Aid, the Alan Gross scheme, creating a fake Cuban Twitter, holding fake HIV prevention seminars and infiltrating Cuba's hip hop scene, to undermine Cuba's political system. But should indeed a U.S. embassy return to Havana that job will fall again to the CIA. Cuba should be very worried about that. The only reason why the U.S. government has never fallen to a CIA coup is the lack of a U.S. embassy in Washington DC. There is no reason for Cuba to trust the U.S. and it should be very careful about opening the country. It is not only the U.S. Aid meddling or the Cuban missile crisis, (which eliminated U.S. nuclear weapons in Turkey pointing at Moscow), that give reason for caution, but also the various other attack plans and assassination attempts against Cuban leaders. There are also all the recent "regime operations" the U.S. ran and runs in Ukraine, Libya, Syria, Hongkong and elsewhere. Whatever it may say publicly the U.S. will certainly continue to undermine Cuba's socialist system and to press for "regime change". Cubans should recognize that any embrace by the U.S. is at least suffocating if not deadly for their self-determination. The Abbott regime sent its heavily armed regime forces and shabiha to storm a beloved chocolatey place where a moderate anti-Abbott rebel was protecting peaceful protesters. Standing under a dark version of the flag of Saudi Arabia the protesters had presented (vid) simple and reasonable demands. Instead of agreeing to step down or to at least to offer a compromise Abbott coldly rejected all of them. During the guns blazing assault (vid) by regime forces the honorable moderate guard, Mufti Sheik Haron, was killed and several peaceful protesters were severely wounded. Why didn't Obama provide them with weapons to defend themselves? The United States has stopped paying most of the pro-western rebels fighting in northern Syria and has suspended the delivery of arms to them, rebel commanders told McClatchy Tuesday. The U.S. is still paying for some small FSA groups within Aleppo city but these are now surrounded by the Syrian Arab Army and unlikely to be able to hold their positions. Their hold of Aleppo city is politically symbolic and therefore something the U.S. wants them to keep. It is the reason why the UN envoy is trying to negotiate a ceasefire for Aleppo. Syria and Russia are playing along but Aleppo will likely be completely in government hands before any ceasefire is reached. As part of the attempt to surround Damascus, al-Nusra Front was able to continue a simultaneous offensive to the south of the capital. The offensive led to significant advances in Dara’a province, including the taking of the government’s military base in Dara’a city. Because Dara’a borders directly on Damascus province (Rif Dimashq), these advances set up a future offensive into Damascus proper. I have been told that the nearly complete collapse of the unicorn army of FSA moderates has caused the US to covertly approach Nusra with a proposal to offer support if Nusra will scale back its IS-like habit of butchering its enemies when they are captured. That would include a more tolerant attitude toward US journalists. A leopard does not change its spots and Nusra does not stop its beheadings. A video from Sheik Miskeen, a town halfway between Jordan and Damascus which is currently the center of fight in the south, shows dead Syrian soldiers who were beheaded after Nusra, with the help two large suicide vehicle bombs, captured a military housing area. The Pentagon is deliberately walking very slow with that train and equip program. It may well end before it achieves any results. The only enemies left to fight for the Syrian Arab Army are remnants of the FSA/Jabhat al-Nusra and the Islamic State. The Islamic State has achieved nothing in its campaign on the Kurdish enclave Kobane. The Kurds are holding their positions and while it is sad that the city gets destroyed through the fighting the Islamic State is losing lots of materials and people. The U.S., which is supporting the Kurds in Kobane with a few air attacks, wants to keep it that way. Kobane is used to destroy wave after wave of Islamic State attack groups and to exhaust its reserves. The Islamic State has looked for new targets in east Syria and decided to attack the military airport in Deir Ezzor, held by the Syrian army. Several waves of attacks with suicide bombers and lots of IS infantry have had no success there. Deir Ezzor is well supplied and well defended and will be another point where IS is using up its reserves. The U.S. has given up on the attacks in north Syria. In the south its support for Jabhat al-Nusra is indefensible on political and moral grounds. It will have to stop before it attracts more public scrutiny. Otherwise some Republicans in Congress may find that direct support for al-Qaeda by the Obama administration is an impeachable offense. Soon the Islamic State will be the only significant threat left to fight in Syria. But the Islamic State is loosing large parts of its energy (and money) due to heavy losses in fights on several fronts. It is still a serious enemy and may achieve this or that surprise. But I doubt that it is an existential threat to the Syrian government and the Syrian people. In August 2046, after three years of space travel, thirteen divisions of U.S. Marines landed on Mars to fight remnants of the Islamic State who recently started to spread through the colonies there. Confronted with protests over the costly measure the president pointed out that the U.S. Congress Resolution for Unlimited War, adopted in February 2015, gives him the sole authority to determine the location, size of force and length of the war against ISIS. Secretary of State John Kerry urged Congress on Tuesday not to preclude the use of ground forces to fight the Islamic State as lawmakers consider setting limits on the nature and extent of American involvement in the military campaign against the group. Mr. Kerry said that any congressional resolution should not impose geographic limitations, reasoning that the Islamic State might try to attack American forces or facilities outside of Iraq and Syria. Mr. Kerry said that a three-year time limit would be acceptable, as proposed by Senator Robert Menendez, the New Jersey Democrat who is chairman of the committee. But Mr. Kerry said the resolution should include a provision that would allow that time limit to be extended. No limit of the size and type of application of force, no geographically limit, no real time limit. Obama is asking Congress to permit him to wage completely unlimited war. The Authorization for Use of Military Force (AUMF) given by Congress on September 14 2001 was arguably more limited than the authorization Obama is now asking for. That AUMF has been and still is abused by Bush and Obama to bomb or invade 7 or 8 countries, to torture and kill. Obama uses it to justify his killing of more than 3,000 mostly unknown people through drone strikes. With the new unlimited war authority (and as usually ignoring international law) Obama and any future president could turn the full U.S. military might onto any place where some crazy dude waves an ISIS flag. Congress should not give such an authorization. But think of the tens if not hundreds of billions of dollars that can be made by the military-industrial complex should Congress authorize unlimited war. Think of the many millions which will flow back to representatives, senators and their families and friends. Is there any reason to believe that Congress will not give Obama exactly what he is asking for? Is there any reason to believe that Obama and his successors will not abuse such an authorization? The Senate Intelligence Committee torture report (pdf) is out. I do not expect anything really new in it. 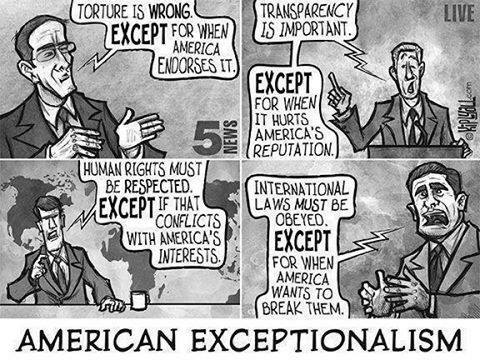 We already know that the CIA torturers as well as their political bosses were sadists. The report is a whitewash in that it does not point out the legal and political culprits who ordered, justified and committed the torture acts. The report is also limited to the CIA and does not include the military which, as we know, also used torture and killed people in "interrogations". The U.S. is bound by law to prosecute all of them from top to bottom but it is unlikely to happen. Only one person from the CIA went to prison over the torture program. This not for committing torture but for revealing it. Torture is useless, especially for interrogations, because people under torture will say anything to make the pain stop. But that very simple and often proven conclusion should to be easy to understand. 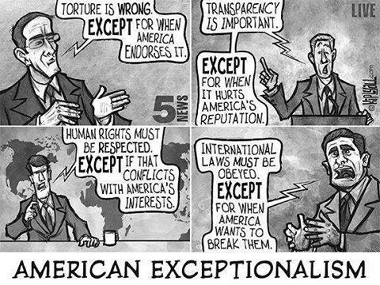 But the U.S. is still not committed to refrain from torture. The Army Field Manual 2 22.3. Appendix M is still in force and it allows "interrogation technics" which the UN’s Committee against Torture says (PDF) amount to torture. The White House is also still believing that using torture abroad is not covert by the UN Convention Against Torture and thereby permissible. Yemen: Did U.S. Surveil Hostage Negotiators To Hit Hostage Takers? More questions arise about the recless U.S. rescue attempt in Yemen that killed a nearly free hostage as well as at least nine others. The U.S. claimed it was trying to free Luke Somer because AlQaeda in the Arabian Peninsula (AQAP), a mixture of tribal Yemeni and Jihadis, threatened to kill him. Al Qaida in the Arabian Peninsula (AQAB) posted a video online on Thursday, threatening to kill the American citizen within three days but his stepmother Penny Bearman and half-sister Lucy Somers indicated they still had hope because previous threats had not been carried out. Bearman, 55, of Deal, Kent, told the Times they were “quite angry because if there had not been a rescue attempt he would still be alive”. “We are sure Luke would have given support to the ongoing discussions [to secure his release] in Yemen rather than the conflict approach. There had been threats before that had not been carried out,” she said. There is another data point that makes me believe that the U.S. not only did know about the negotiations and that Korkie was about to be freed but that it used this information to carry out the raid itself. After months of silence, Gift of the Givers had a breakthrough in August, when tribal leaders sent a delegation, acting on behalf of the charity, into the remote badlands. The assembled Qaeda fighters took a vote on reducing the ransom, and half the jihadists voted “yes” while half voted “no,” Mr. Sooliman said. In October, the abductors said that they would accept $700,000. The family, which had already said it could not afford $3 million, still did not have enough money. In November, the tribal leaders went back to meet with Qaeda members. The car was hit by a drone strike, killing the mediators, according to Mr. Sooliman. “We thought it was over,” he said. But that tragedy appears to have spurred Al Qaeda to agree to a lower sum, which it promised to use in part to reimburse families of the dead tribal negotiators. On Nov. 26, Mr. Korkie’s abductors sent word they would accept $200,000, to be split with the tribe members. In November a U.S. drone hit tribal mediators who were trying to get Korkie freed. How did the U.S. know about these mediators if not by listening to their communication? In early December the cars are ready to leave to finally free Korkie and the U.S. military hits again at the very same moment. There are still rumors that AQAP nabbed a U.S. "trainer" during a raid on Al Anad airbase in November. 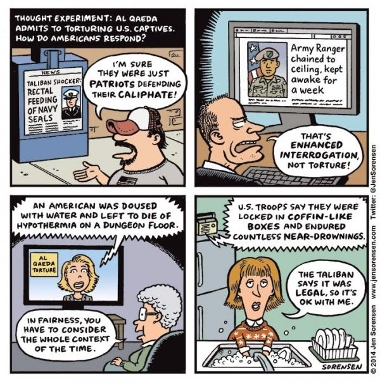 Was that captured U.S. soldier the real target of the failed raids? Or what about the Marine Travis Barton AQAP claims to have captured during Saturday's raid? Today Israeli jets attacked some Syrian military positions near Damascus. Details are yet unknown. But it is important to note that these are not one-off attacks but part for an ongoing active campaign Israel is waging against Syria mostly though through proxy "insurgent" forces. Three days ago the UN General Secretary received a report from the UN Observer Mission mission on the Golan Heights (UNDOF). The report was an indictment of Israel for its strong cooperation with Syrian insurgents including the Syrian al-Qaeda group Jabhat al-Nusra. For readers of MoA the extensive support by Israel of Jabhat al-Nusra and others against the Syrian army, including with direct artillery fire against Syrian government troops, is not news. But the main-stream media had so far lacked any reporting on it. Reports by UN observers in the Golan Heights over the past 18 months reveal the type and extent of cooperation between Israel and Syrian opposition figures. According to the report, UN observers stated that tents were set up about 300 meters from the Israeli position for some 70 families of Syrian deserters. The Syrian army sent a letter of complaint to UNDOF in September, claiming this tent camp was a base for “armed terrorists” crossing the border into Israel. While Haaretz notes some medical support for wounded insurgent fighters it Israel in does not reveal that the numbers are in the hundreds. UNDOF estimates that from 60 to 70 families live in the camps. On 23 September, [UNDOF-]position 80 observed armed individuals gathered in Al Aishah village unloading weapons from a truck. Some individuals were in civilian attire and others in camouflage uniforms. A vehicle with a mounted anti-aircraft gun was observed in proximity to the place of unloading. On 27 October, position 80 observed two IDF soldiers east of the technical fence returning from the direction of the Alpha line towards the technical fence. UNDOF observed IDF opening the technical fence gate and letting two individuals pass from the [Syrian] Bravo to the [Israeli] Alpha side. Following the evacuation of UNDOF personnel from position 85 on 28 August, UNDOF sporadically observed armed members of the opposition interacting with IDF across the ceasefire line in the vicinity of United Nations position 85. The UNDOF observers had to retreat from some of their positions on the Syrian side after being attacked by Nusra and other insurgents. They are now limited in their abilities to observe the various exchanges between Israeli soldiers and the insurgents. To achieve that was likely the purpose of their earlier attacks on UN troops. Today's attack near Damascus will hardly change the course of the war. It is probably just a political move by the outgoing Israeli prime minister Netanyahoo using Syria as a "punching bag" to divert from his interior political misfortune. It is time for Syria and its allied forces to demonstrate to Netanyahoo and Israel that any further attacks by it will have dire consequences. On November 26 U.S. special forces attempted a hostage rescue in Yemen. The circumstances remained murky with some reports claiming that besides some other people a U.S. soldier nabbed a bit earlier was freed. After the November event AlQaeda in Yemen, a mixture of tribal groups and some Jihadis, said that it would kill its hostages should another such rescue attempt be made. Yesterday another special force operation was launched. Supported by Apache helicopters ground troops attacked a compound in southern Yemen. But the operation went wrong. Hostages were killed as were allegedly AlQaeda members. Yemeni sources claim that some Yemeni civilians were also killed. The psychological and emotional devastation to Yolande and her family will be compounded by the knowledge that Pierre was to be released by Al Qaeda tomorrow. A team of Abyan leaders met in Aden this morning and were preparing the final security and logistical arrangements, related to hostage release mechanisms, to bring Pierre to safety and freedom. It is even more tragic that the words we used in a conversation with Yolande at 5.59 this morning was "the wait is almost over". Three days ago we told her "Pierre will be home for Christmas". We certainly did not mean it in the manner it has unfolded. All logistical arrangements were in place to safely fly Pierre out of Yemen under diplomatic cover, then to meet with family members in a "safe" country, fly to South Africa, and directly to hospital for total medical evaluation and appropriate intervention. If the U.S. knew that Pierre Korkie was about to be released the hostage rescue attempt was utterly reckless. Why not wait a day for him to be freed without any additional risks? If the U.S. did not know that Pierre Korkie was to be released tomorrow this can only be called a major failure in intelligence and coordination. Either way I find it unexplainable that Obama in his statement has not even have one word on Pierre Korkie. A person that would likely not have died without the interference of U.S. forces. With such obfuscation, like in the earlier rescue attempt, one wonders who really committed the "barbaric murder" of the hostage. About 40 U.S. special operations forces were part of the mission, according to the U.S. officials. The rescuers, backed by Yemeni ground forces, got within 100 meters of the compound in southern Shabwa province when they were spotted by the militants, and the skirmish ensued. The operation began before dawn Saturday in a province that is a stronghold of al-Qaida's branch in Yemen. U.S. drones struck first the Wadi Abdan area first, followed by strafing runs by jets before Yemeni ground forces moved in, a Yemeni security official said. Helicopters flew in more forces to raid the house where the two men were held, he said. At least nine al-Qaida militants were killed in an initial drone strike, another security official said. Drones, jets, helicopters - that all sounds like a very noisy arrival. But the real question to me is this. The charity folks were certain that they would get their South African guy out save by tomorrow. But waiting for that could have possible jeopardized the life of the U.S. journalist. Proceeding with the raid would endanger both lives plus the lives of the operators and "collateral" persons. Was there a decision made to prefer the rescue of the U.S. citizen over the life and freedom of the South African citizen? Who made that decision? Some people mourn the death of The New Republic while claiming it was some kind of "liberal" magazine. Since my first contact with TNR writing in the 1990s I have never experienced TNR as "liberal". It was a racist neocon rag written by overvalued white men who liked to hear themselves, and only themselves, talking. They reliably endorsed the worst possible policy on offer. Some people agree with my take. And Billmon has, as always, some fitting and biting analysis. Now would someone please take down the Washington Post or rebirth it as a somewhat serious newspaper? Beginning Wednesday, the pilot program will test different cameras on 60 officers from six precincts. Engineers in the new Utah datacenter run by the National Security Agency have prepared special stream collection servers to provide realtime processing of the new videofeeds. Automatic numberplate and face recognition together with GPS data will be used to create data records for future analysis. "We are usually not allowed to collect or use such data of American persons," a NSA spokesperson said. "But this is simply legal administrative assistance for the FBI and the local police," the spokesperson added. "We are just a bit further along with this than they are." On the fly comparison of the video data with existing databases will allow to alert the policemen of searched-for automobiles. The cameras will also make make discrete noise should the officer approach persons who have their face-features stored in the national deviating person database. An additional feature utilizing Google glass and yet to be tested will provide the policemen with the name, date of birth and additional data like medical records of each person in their field of view. Some of the video streams will be shared with the public. FOXNews signed a sponsoring contract with the NYPD that will allow it to exclusively use the streams. "Just imagine the possibilities," Mr. V. O. Yeur, FOXnews vice president for business development, explained. "We will have the most goring night-programs from these feeds. Live and for nearly zero cost. Car accidents, marriage fights, murders each and every night - all without expansive additional equipment and personal in the street. The advertisers and shareholders will love this." Asked about possible problems with the anonymity of people not wanting to be recognized on camera V.O Yeur replied: "There is absolutely no problem with this. The viewers will never be able to see the recording policemen in those feeds and they will never learn their names. These exiting new programs will be broadcasted while offering the officers complete anonymity." Not in the mood to write. Please entertain yourself but keep it civil.